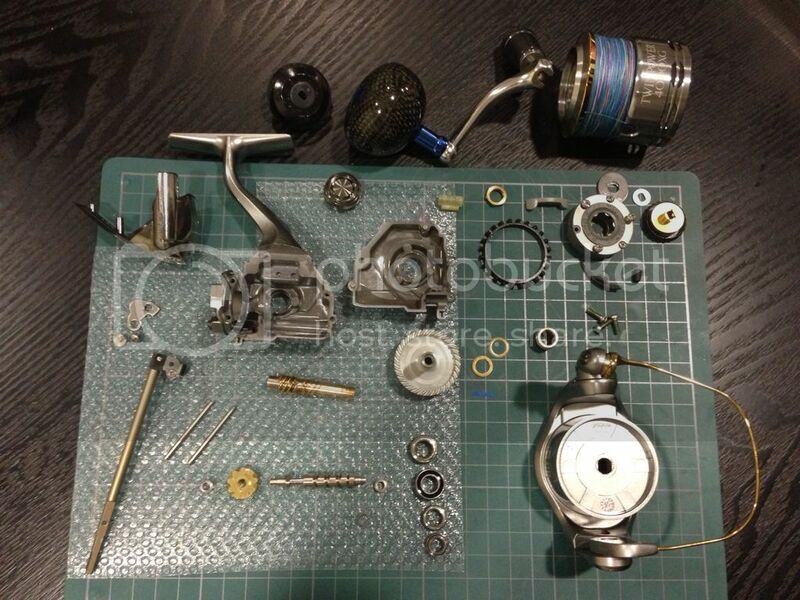 Thought i should just consolidate all my shimano spinners modd and servicing i have done for some of the forum kakis into one thread. 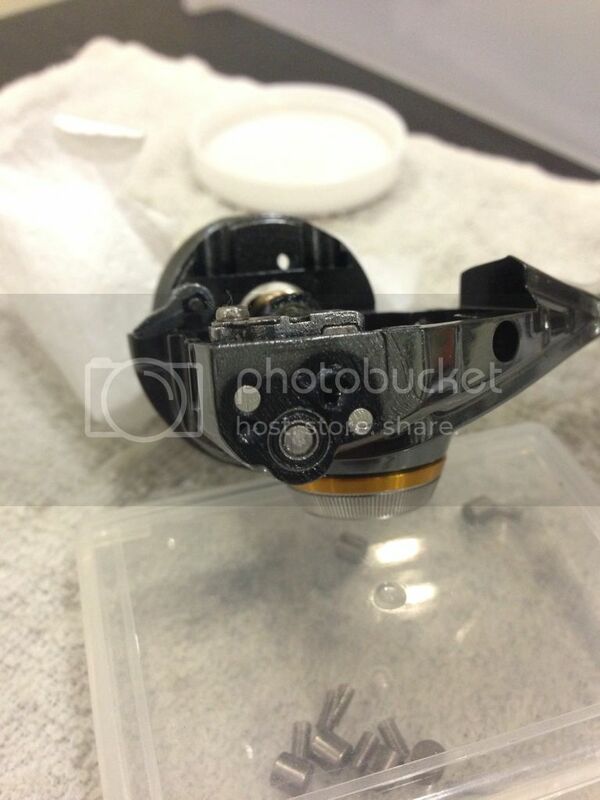 The following reels are done for kaki Lawrence. 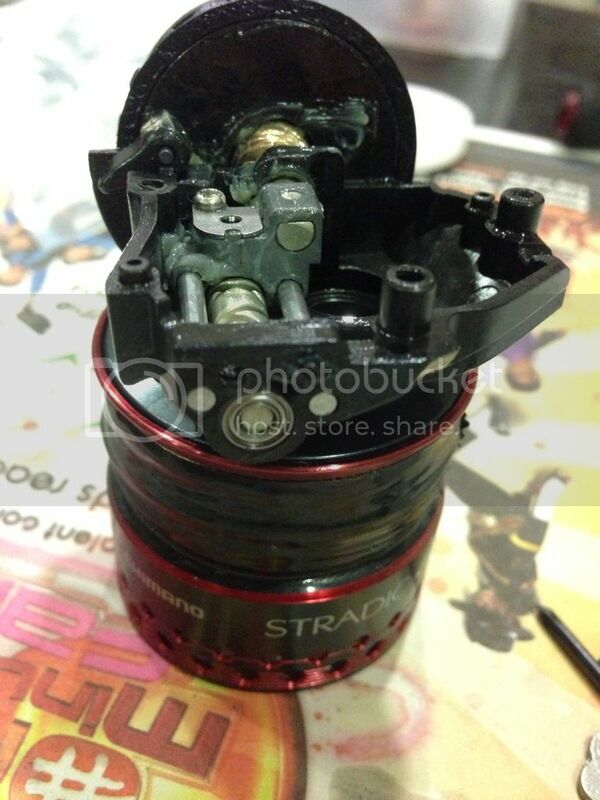 after checking, found out it was caused by a melted rubber friction ring. purchase part and put in a new one. A Twinpower SW5000Pg servicing for Kaki Meng. 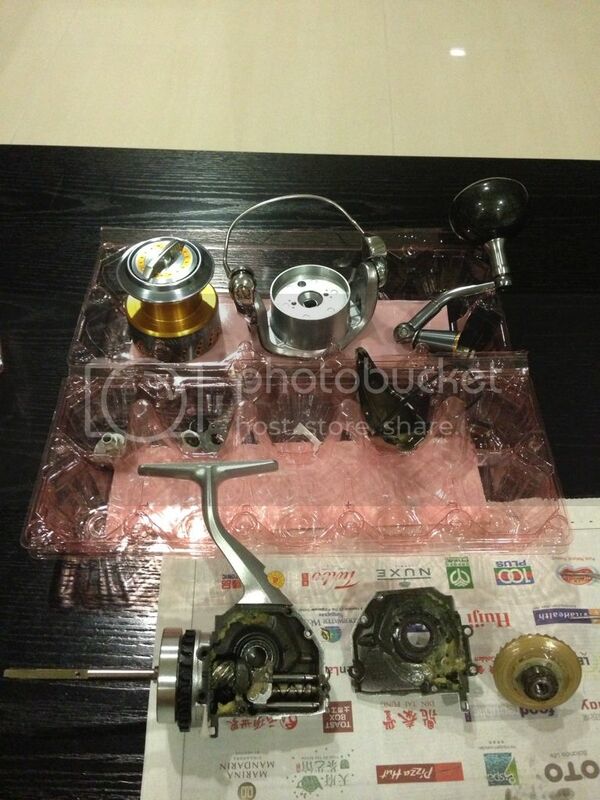 He bought this reel from a forum kaki where he posted this reel as 9.9 cond and seldom use. But the condition is beyond my imagination for a 9.9 rating. More of a 7.5/10 to me. Nice work. 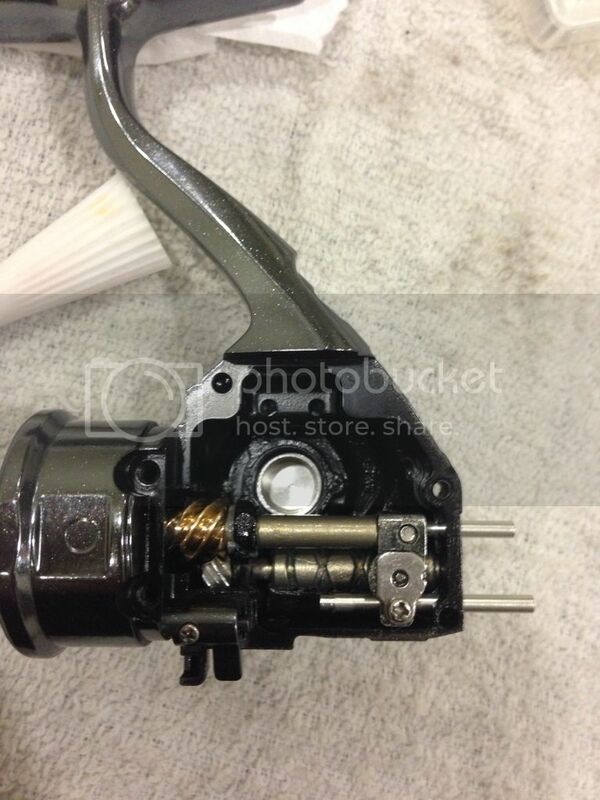 Really love to see those reels super clean inside out. Cant wait for my stradic. Your stradic abit tricky. 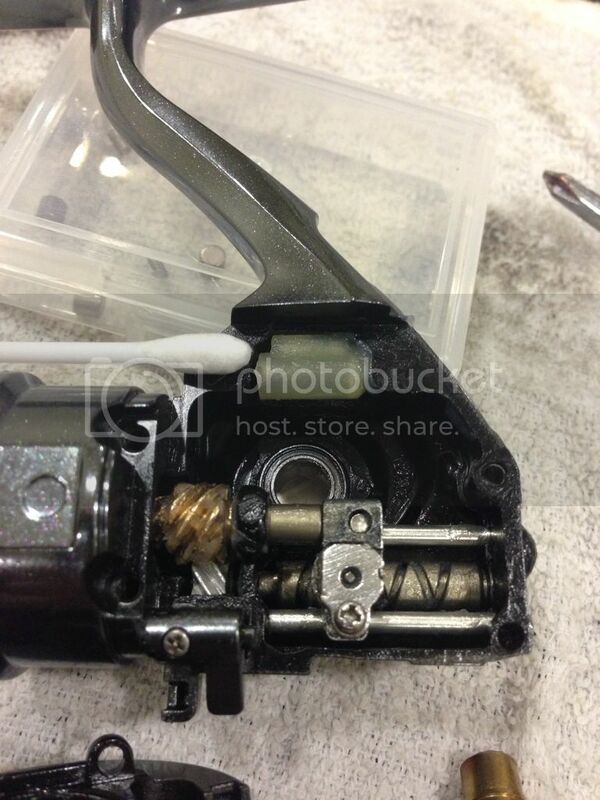 Rotor screw thread for the Bail arm already stripped. I tried epoxy but cant make it. I will source for a slightly larger diameter taping screw to do the job. Hopefully i can find one. Done another upgrading of a 2011 Twinpower 4000XG for Brandon. 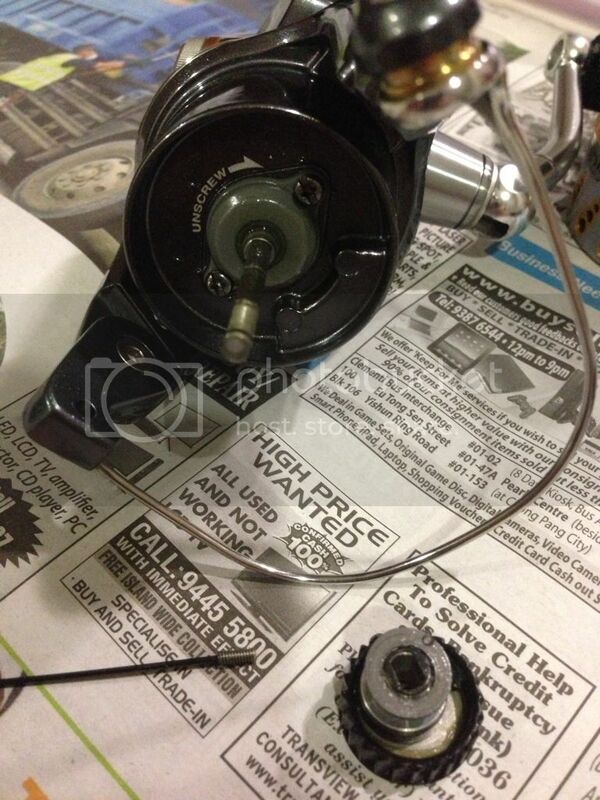 Replaced the two original plastic bushings with bearings supporting the oscillating worm gear and did a full servicing using Shimano Permalube and CAL's for the drags. 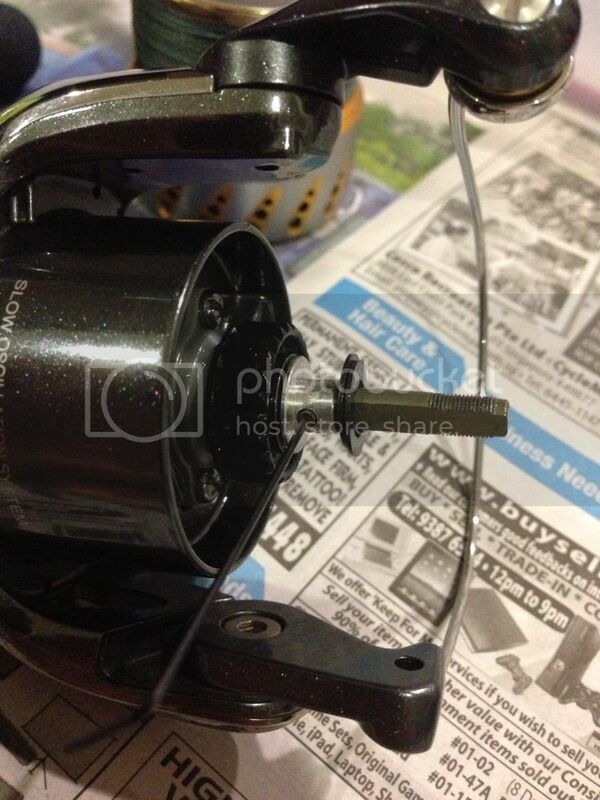 Fast and friendly with regular updates on the condition of the reels as the servicing went on ! 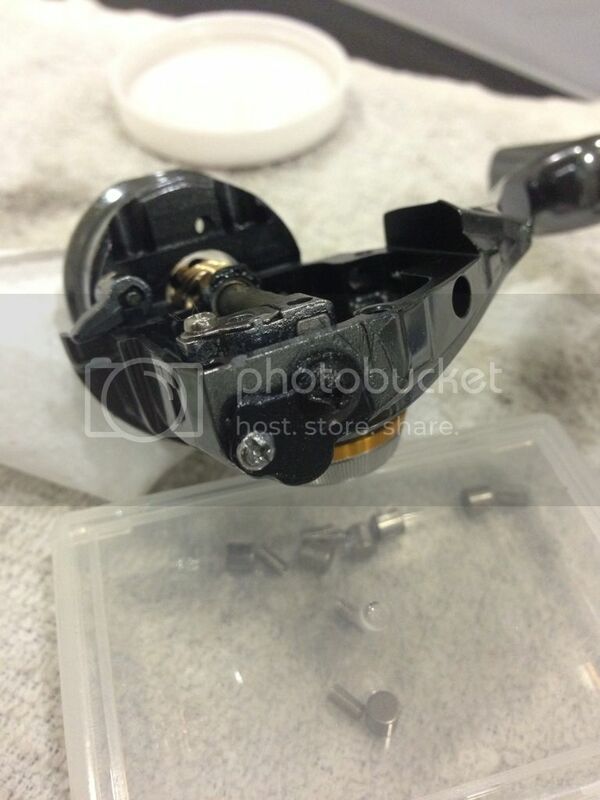 thks for the help servicing those 3 reels bro ! Thanks again for the trust and support. 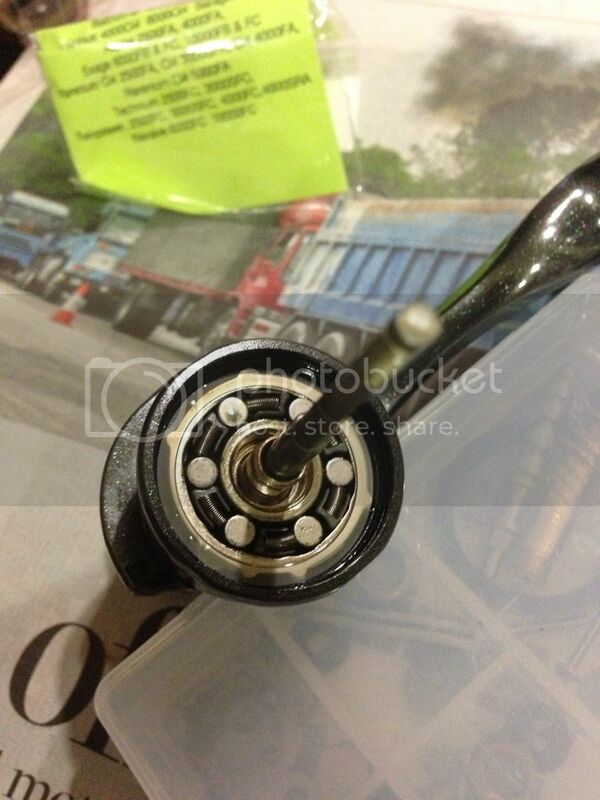 Completed bushings replacement and servicing for kaki Ru-d's Stradic Ci4 2500. 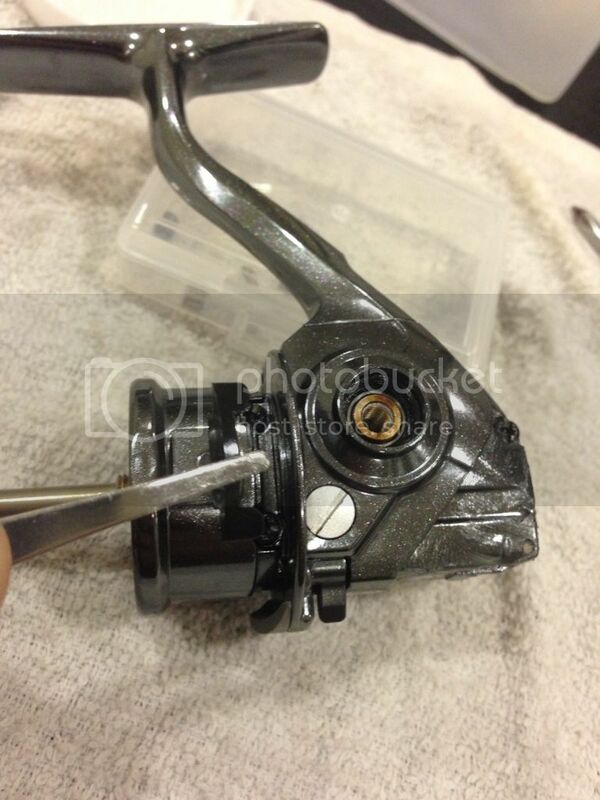 Another stradic Ci4 1000 bearing upgrade and Ryobi Artica servicing for Eugene. Brought my beloved '11 Twinpower c3000 to Jason to replace the worm gear bushings to ball bearings last night and i didn't regret it one bit. 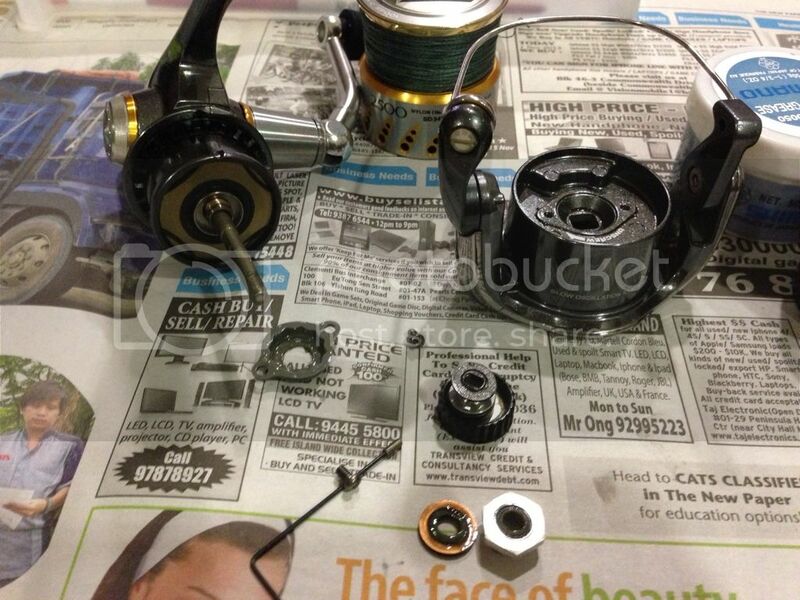 Though suffering from a flu he still did a great job, patiently stripping the reel apart, did some cleaning up and replaced the bushings. 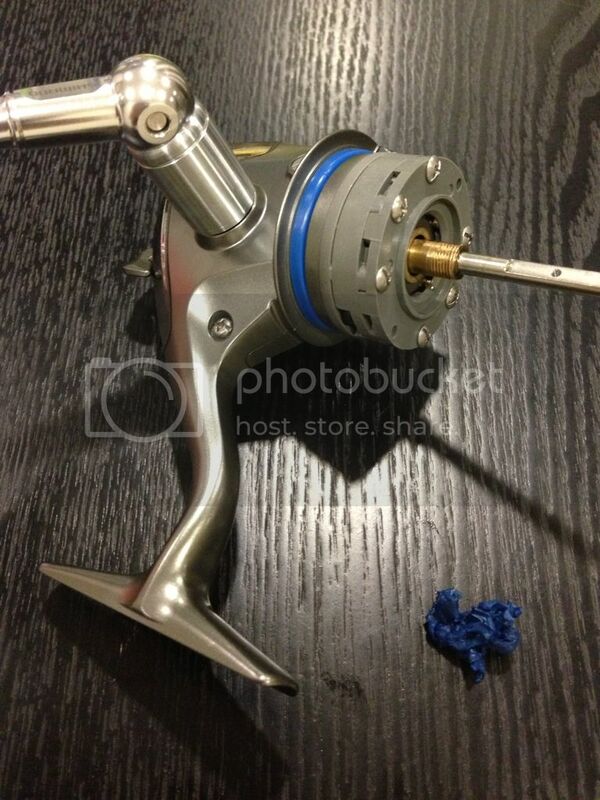 After the modification my reel felt so much more solid and smooth.. no need to upgrade to Stella already. Oh and he had a really cute dog and he gives great advice. Its my pleasure meeting you bro. 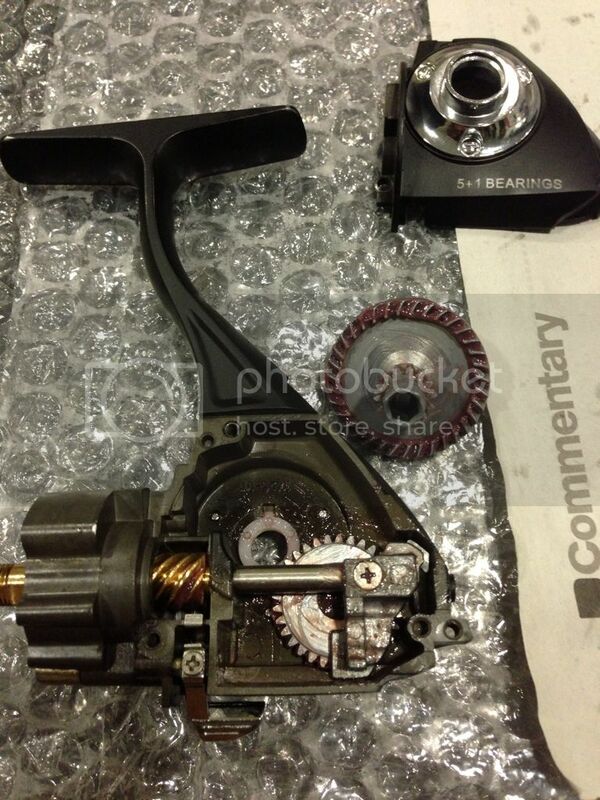 im glad you can feel the difference after the bearing modd. 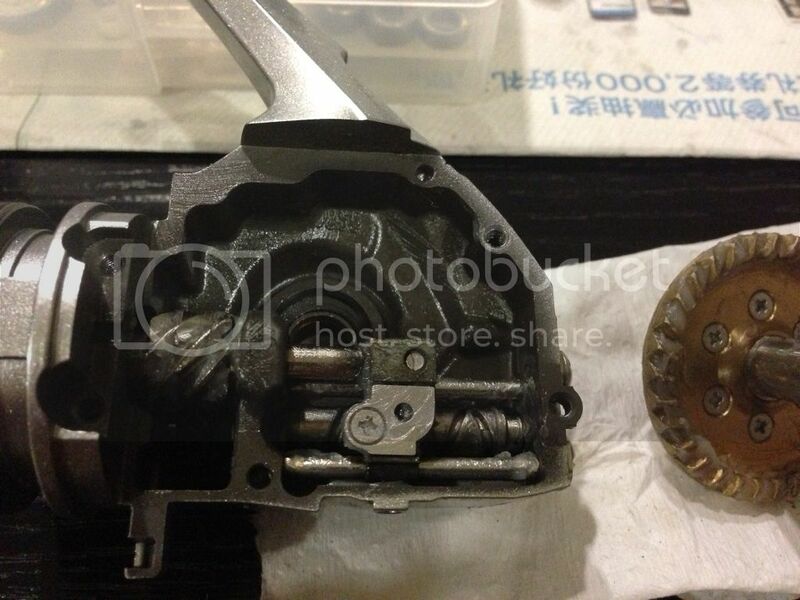 will u be able to service a 95 Stella 2000? 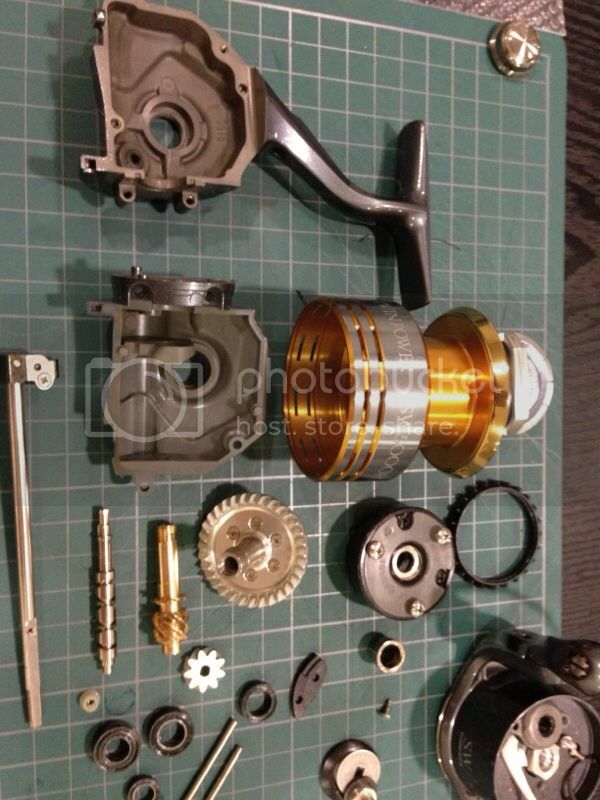 Any problem to get spare parts?? 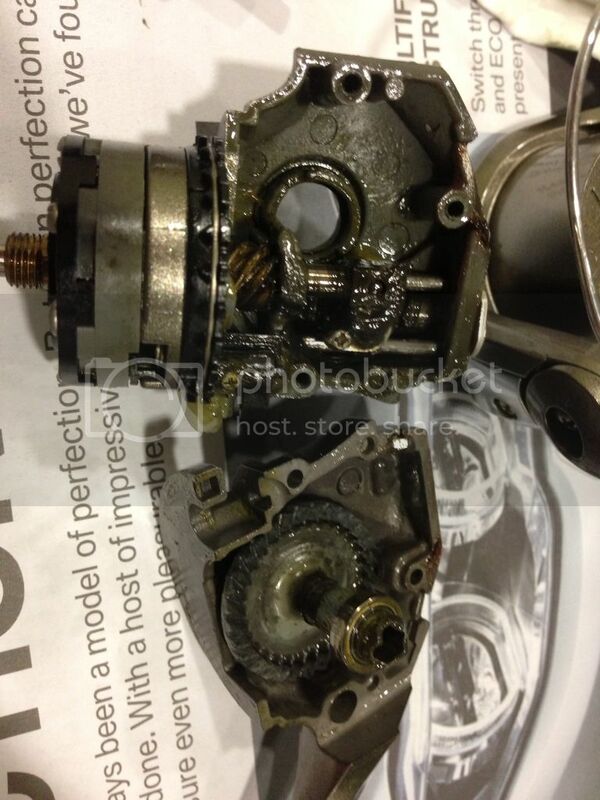 Hi, i can service the stella but i will need to find out if 05 stella parts are still avail tru TTC. 2008 Stella Sw5000pg regular servicing.....for jackie. 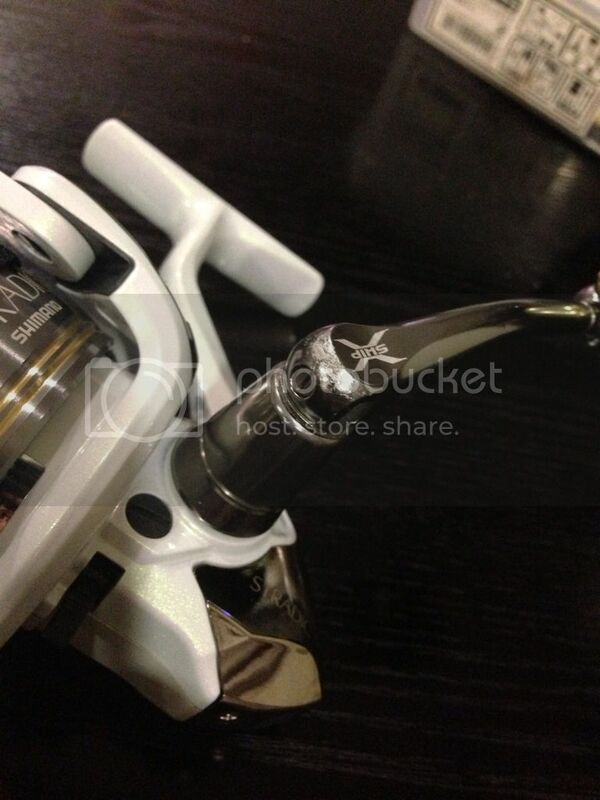 Embarrassing to say this is the first time I have seen this thread, I must say it's super interesting, I like how you take the time to buff and wet sand the reels and how you brought that white reel back to life is amazing. 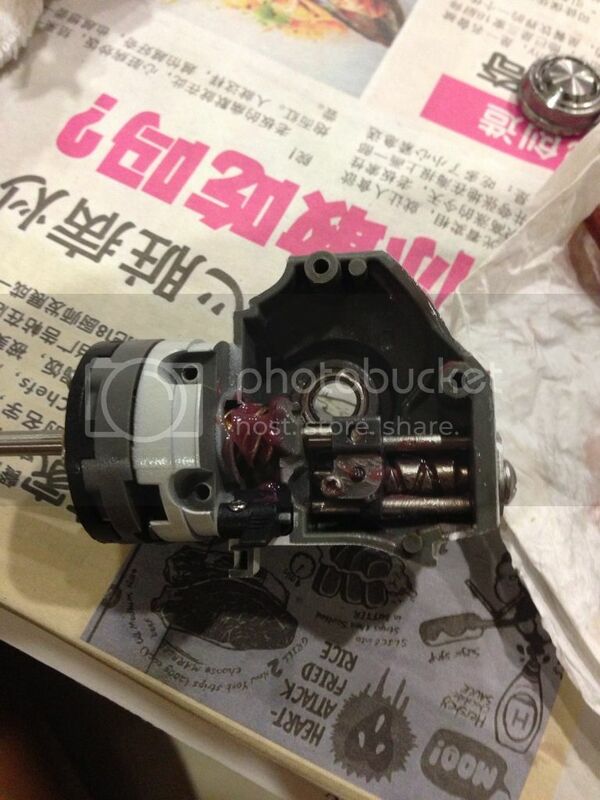 I have a bunch of parts I want to put back into my Stella 1000 if it is something you are interested in. Keep the interesting posts coming bro. Thanks very much for the nice feedback. If you need any help in the stella 1000, feel free to pm me. Gary entrusted his 07 Stella 2500 to me for an overhaul. 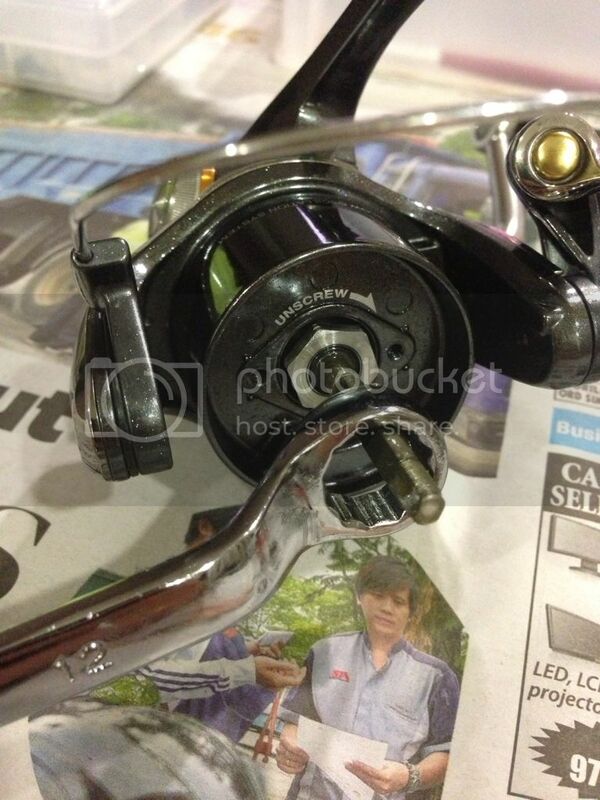 The reel has not been ever serviced before and it feels abit "Rough", and it does not feel as buttery smooth as a Stella should be. 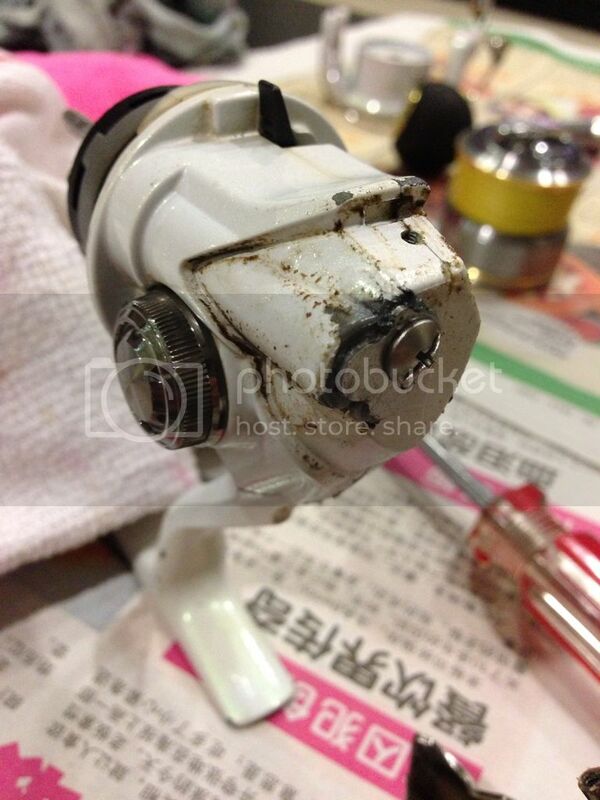 Pinion/drive Bearings are suspected to be the culprit. Through the support and trust that some bros here have given me, I have made a couple of new friends who share this passion of fishing. 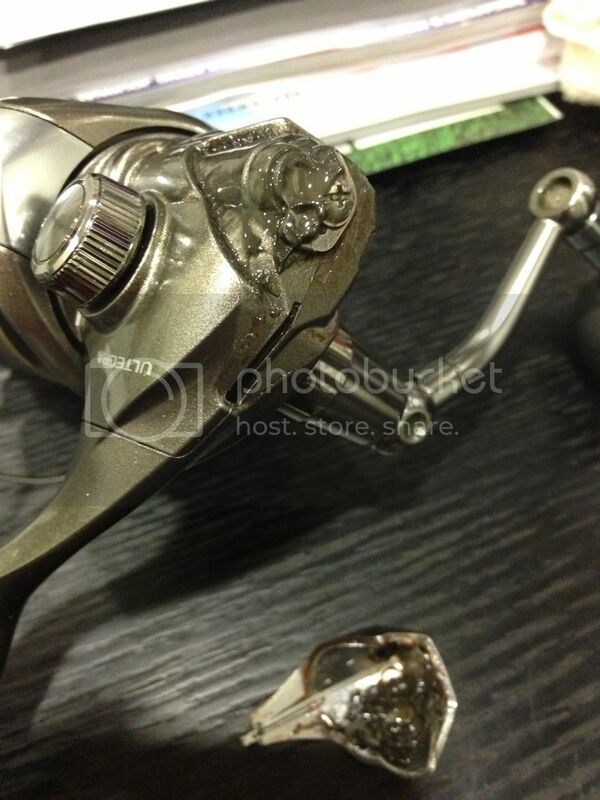 This gives me moltivation to document the process of servicing this shimano's flagship spinner with more details. Hopefully with this documentation, you can also try to DO IT YOURSELF. 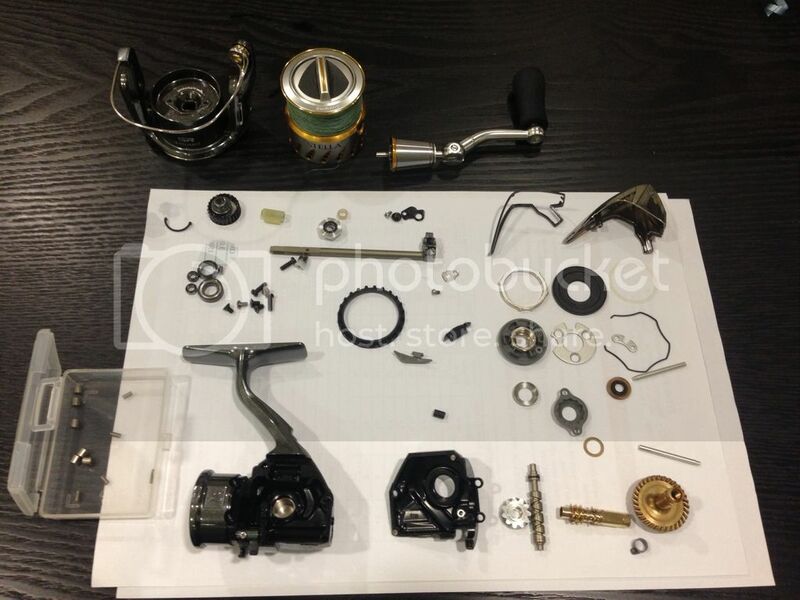 Stripping and assembling a Stella is not as complicated as you would think. well, here it goes on this first installment. 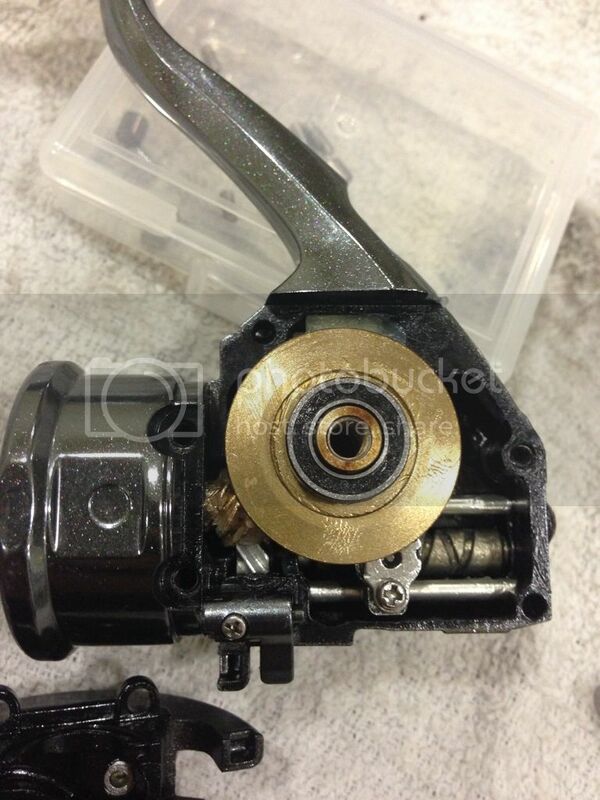 After loosening the drag knob with the spool removed, you will see the drag clicker rachet with the spool support assembly. 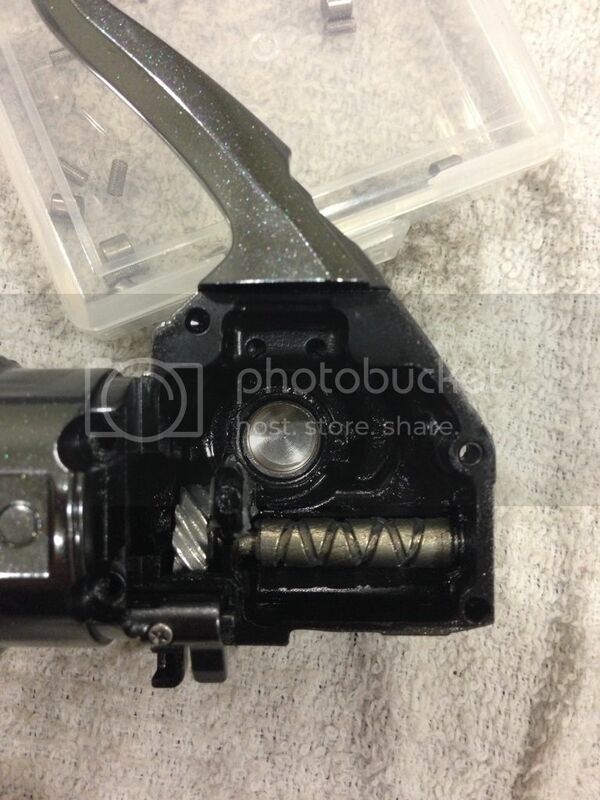 To remove this assembly off the main shalf, there is a small hex screw on the bearing bushing as shown. 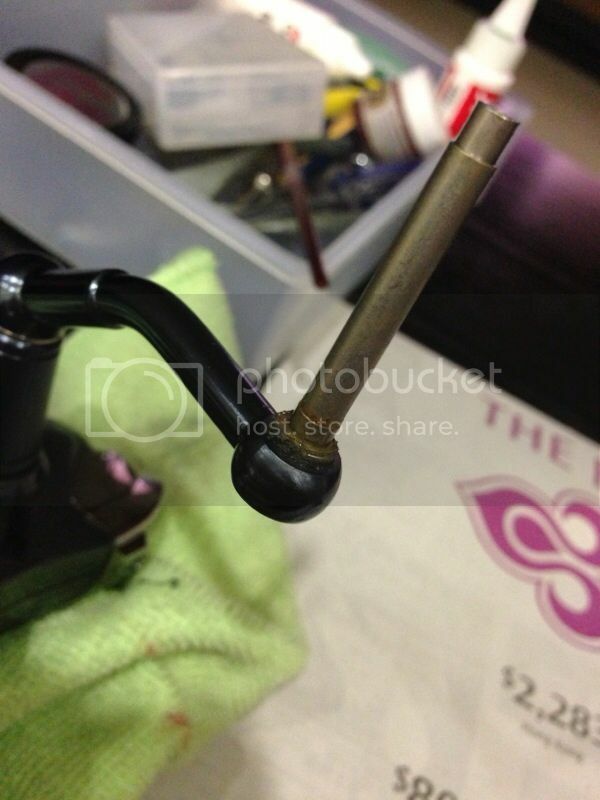 You will need a tiny less than 1mm allen key to do the job. 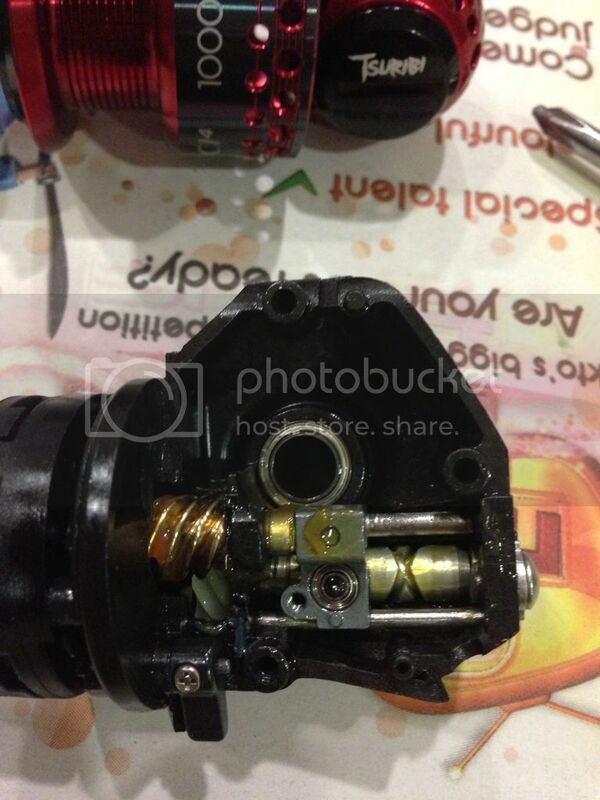 After the tiny Hex screw is removed, slide the whole assembly off the main shaft. 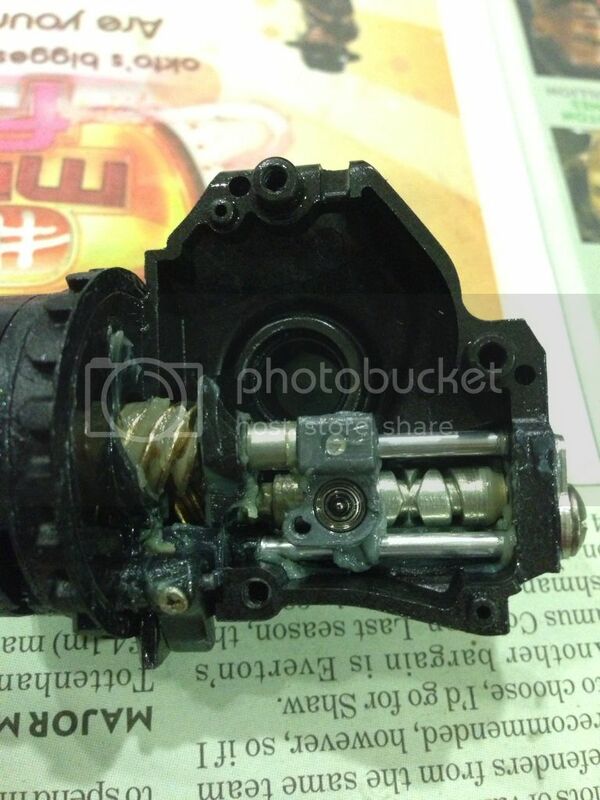 Next, unscrew the 2 screws to remove the rotor nut lock plate to access the rotor nut. 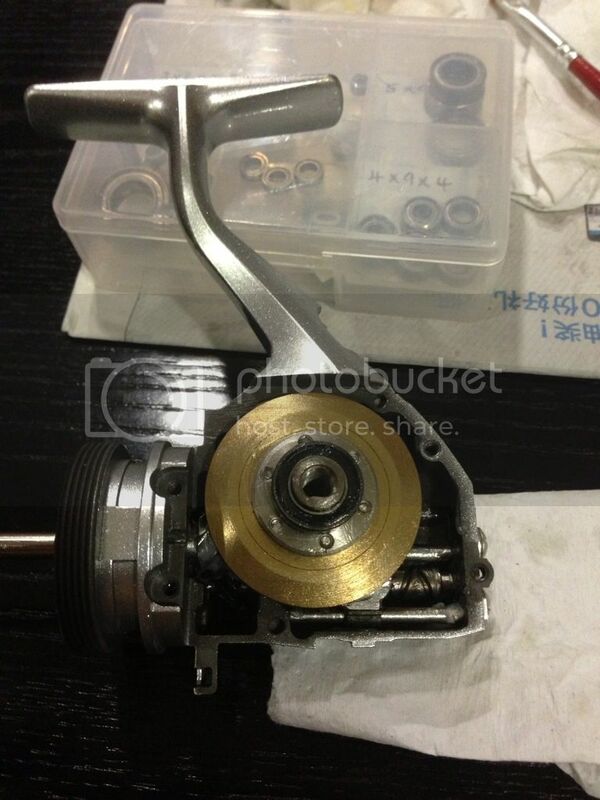 Use a socket spanner to loosen the rotor nut so as to remove the entire rotor assembly. My advice is try not to use an adjustable spanner. 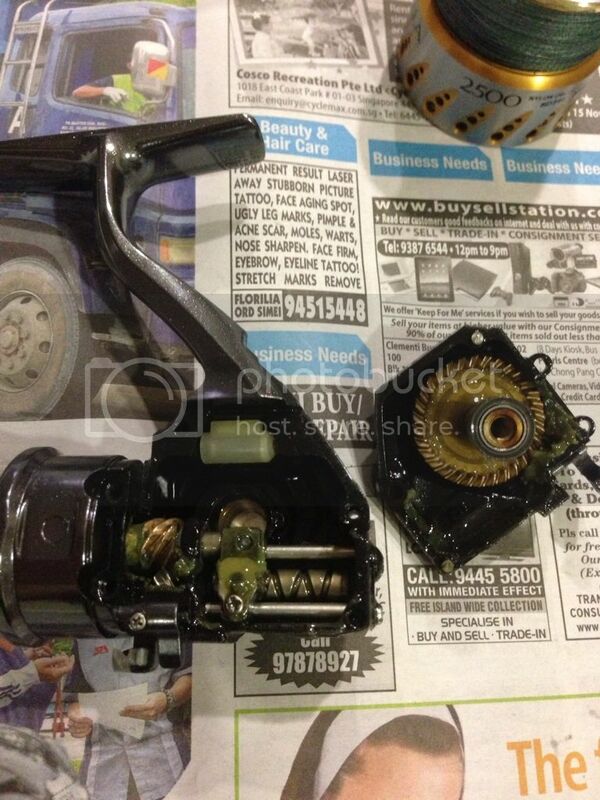 The entire rotor assembly is now removed. 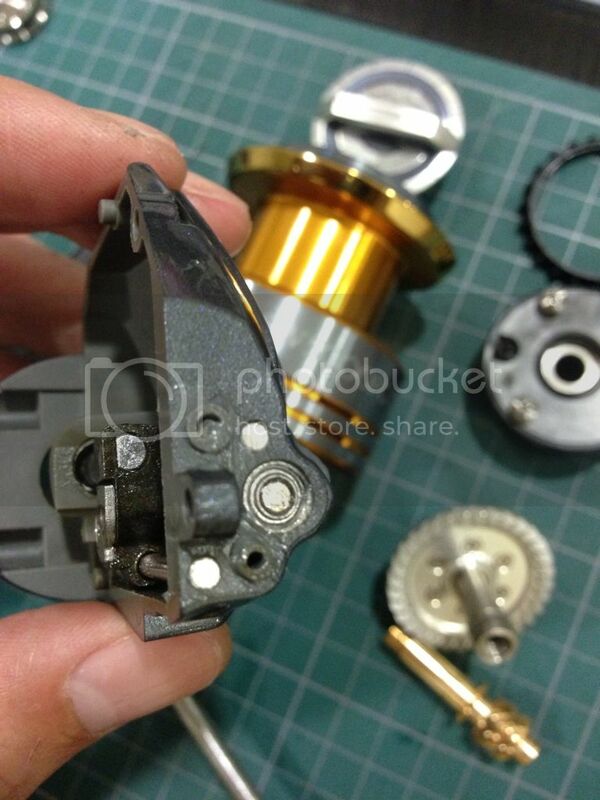 On this 2nd Installment, let's see how do we gain access to the internal gearbox after the entire rotor is removed from the reel body. 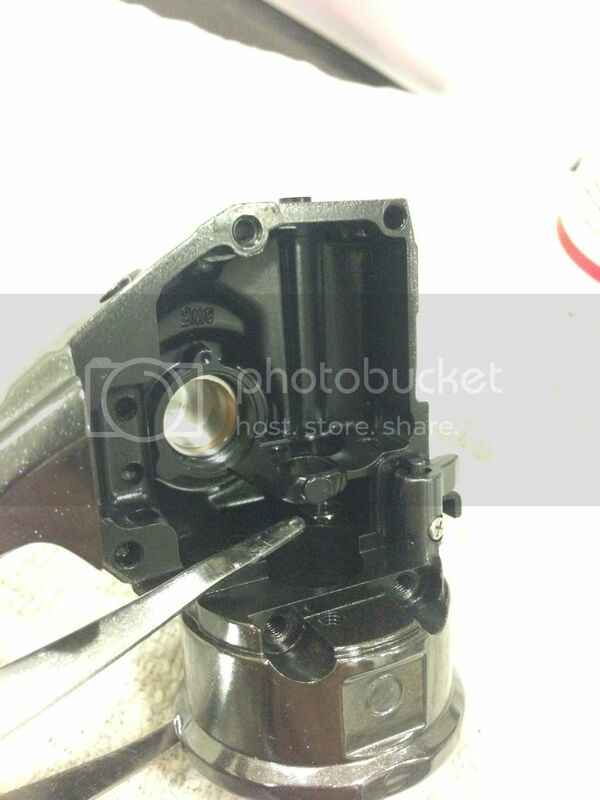 As shown in the below picture, in order to remove the rear body protector piece, we'll need to remove the body flange rubber seal to access the screw underneath. 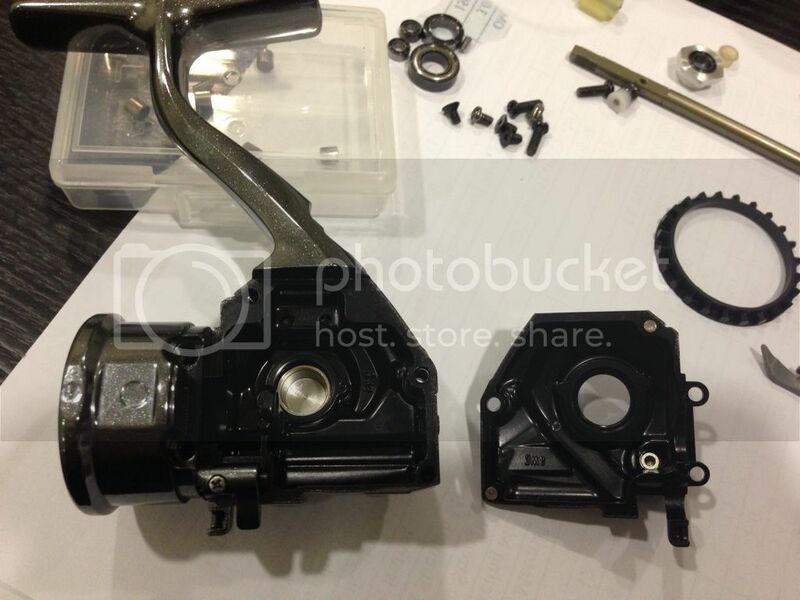 Loosen the screw underneath the body flange seal and the rear body protector will come off. After the rear protector & its rear seal are being removed, you will be able to gain access to 3 other screws that secure the side cover to the main body. 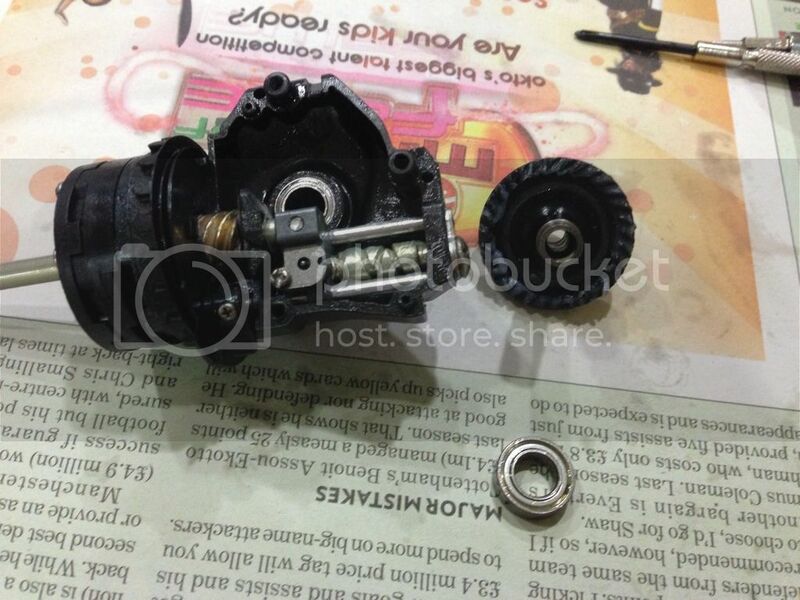 After removing the Side cover from the body reveals the entire drivetrain and its gears. There is a "black color octagon shape clip" also know as the roller clutch retainer that secures the roller clutch cover. 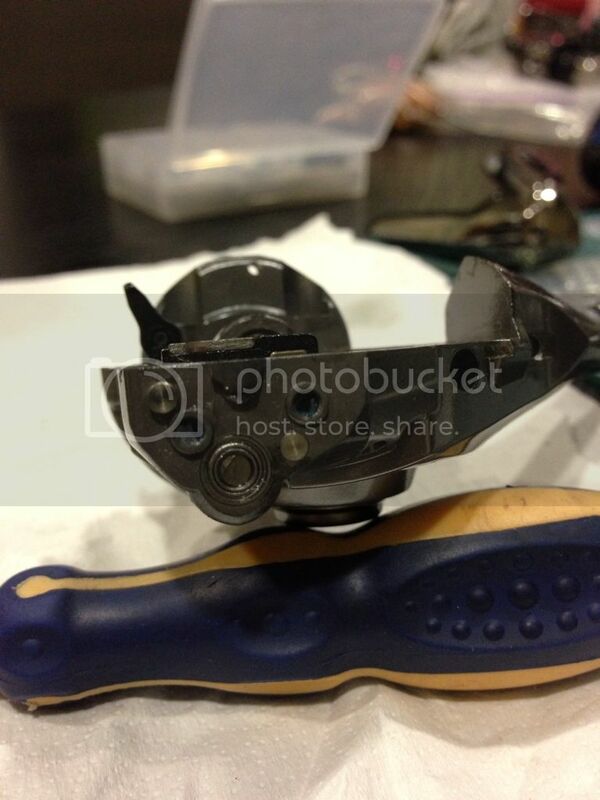 Remove that clip and carefully remove the cover. 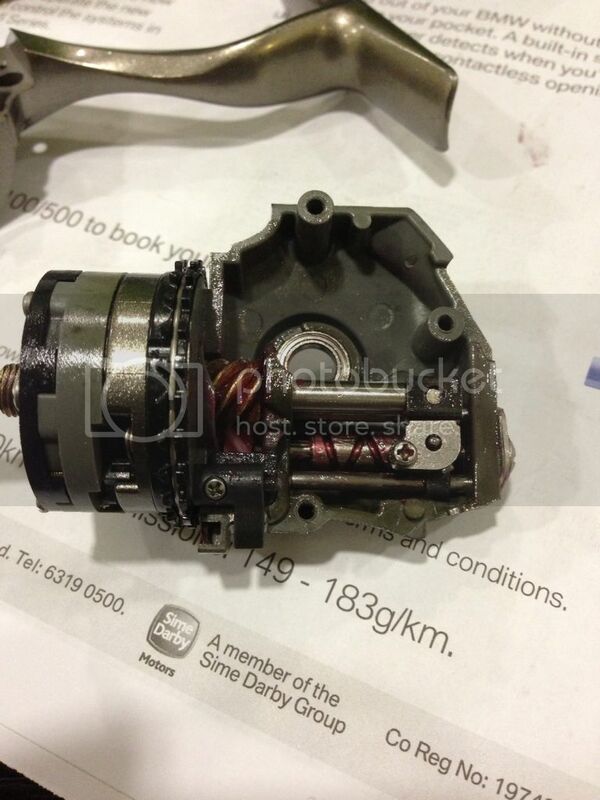 Take extreme precaution when removing this cover as we wanna avoid sending the clutch springs flying off. 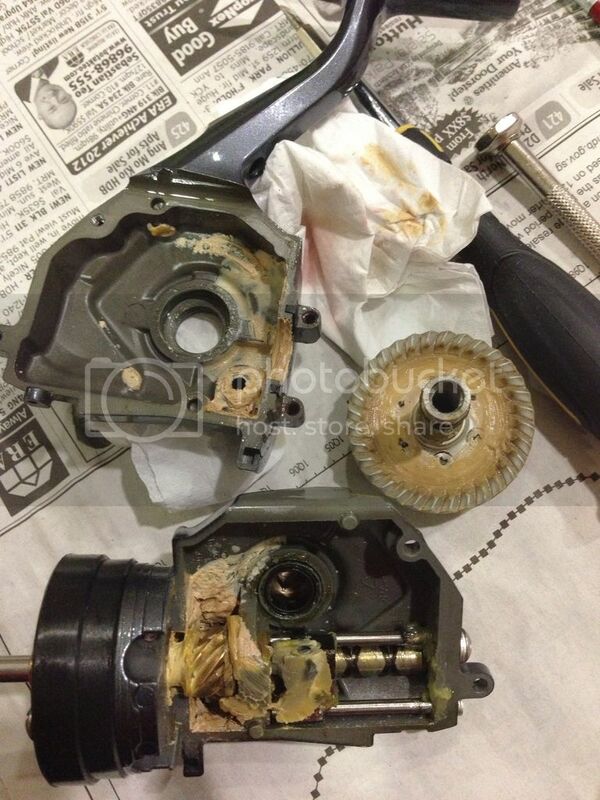 Here's a picture of the roller clutch assembly with cover being removed. 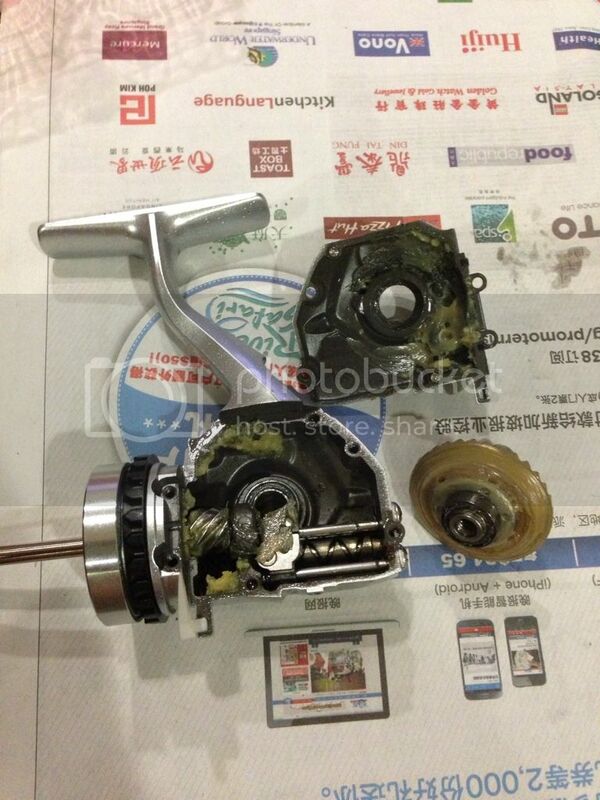 Heng ah, All the rollers and springs are still in placed safely. 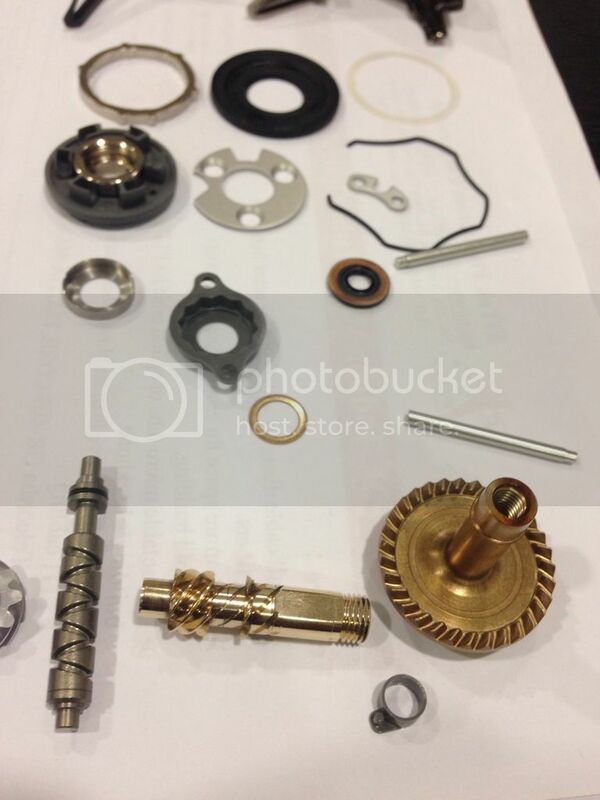 It's time to do some serious clean up and degreasing to the all the gears, bearings and the clutch assembly. 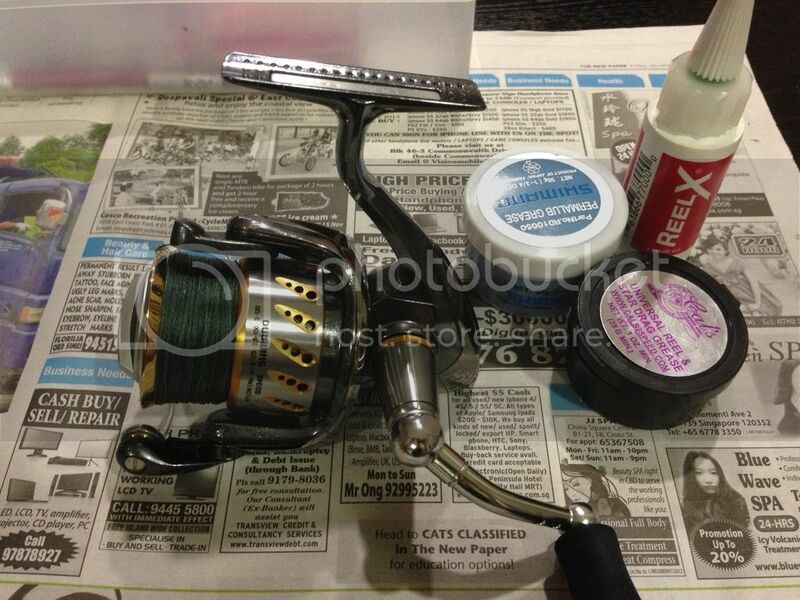 [quote="Luke Maow Bear"]Embarrassing to say this is the first time I have seen this thread, I must say it's super interesting, I like how you take the time to buff and wet sand the reels and how you brought that white reel back to life is amazing. Ok bro, I will PM you. What is the charge for mod and servicing stradic 3000? 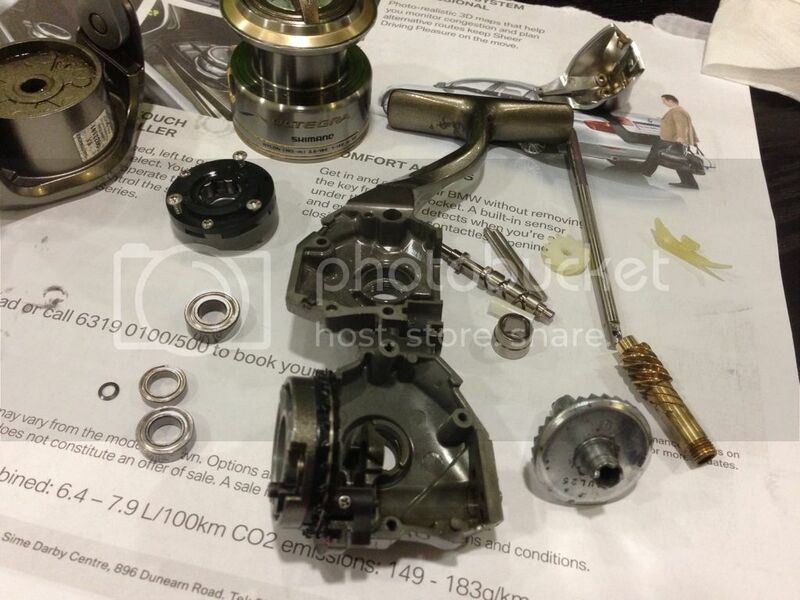 Stella parts degreased and cleaned. 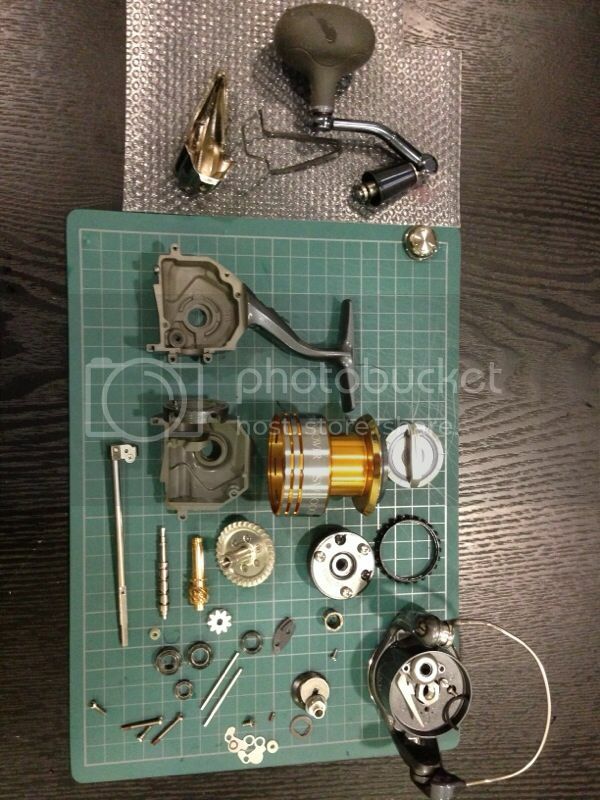 It's time to assemble the stella back. Next goes the grey colour collar bushing for the pinion gear, this is the old design without xship. 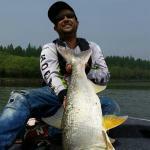 Those reels with xship technology are equipped with a bearing instead which greatly enhance the cranking power, stability and smoothness. 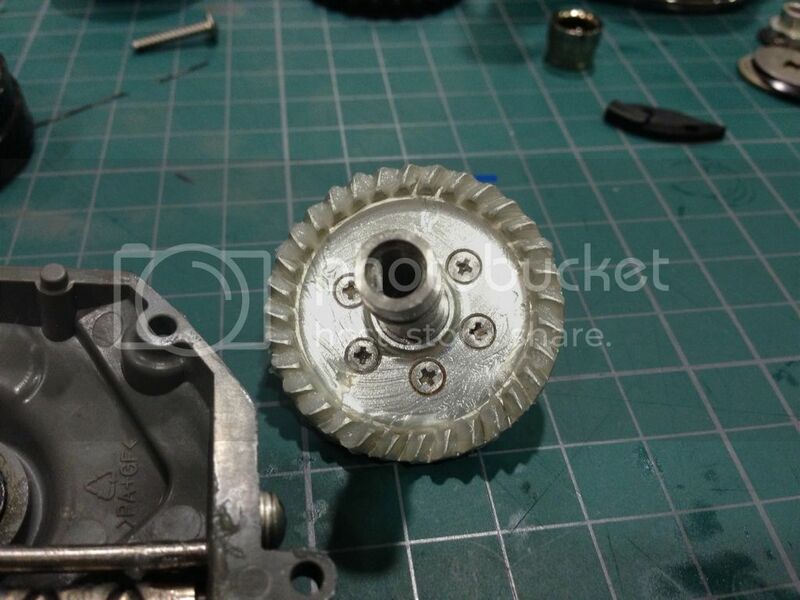 The Idle gear goes in first followed by the worm gear shaft. 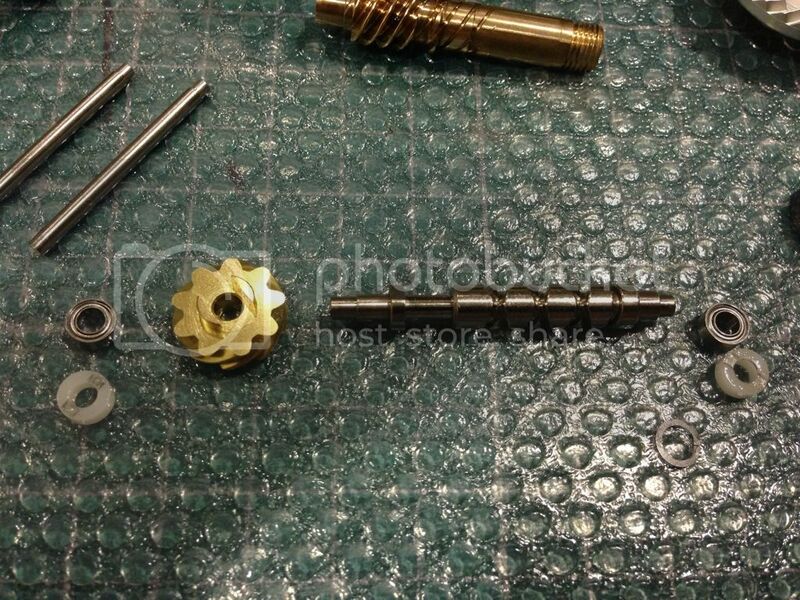 The pawl assembly along with the oscillating slider and the main shaft was assembled prior to this and will goes through from the back of the pinion gear. 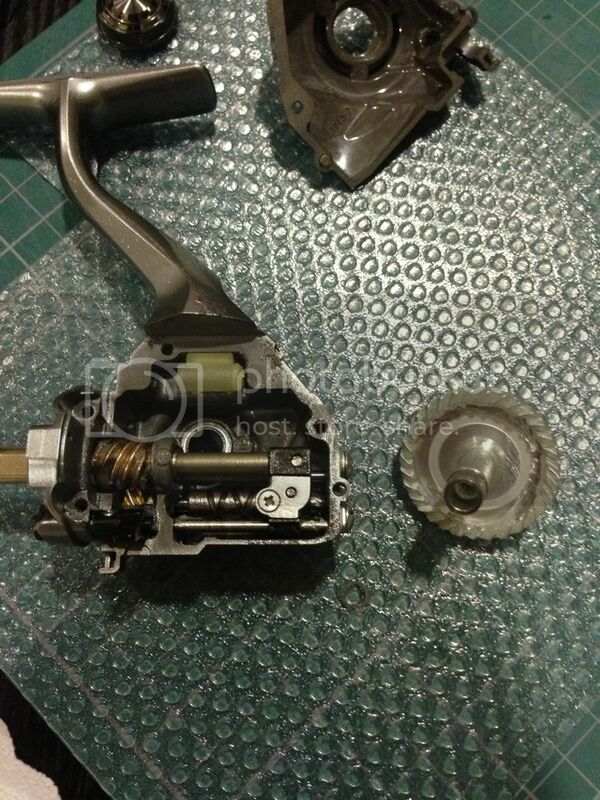 Then the two oscillating guides goes thru from the rear body and then tru the oscillating slider as shown. 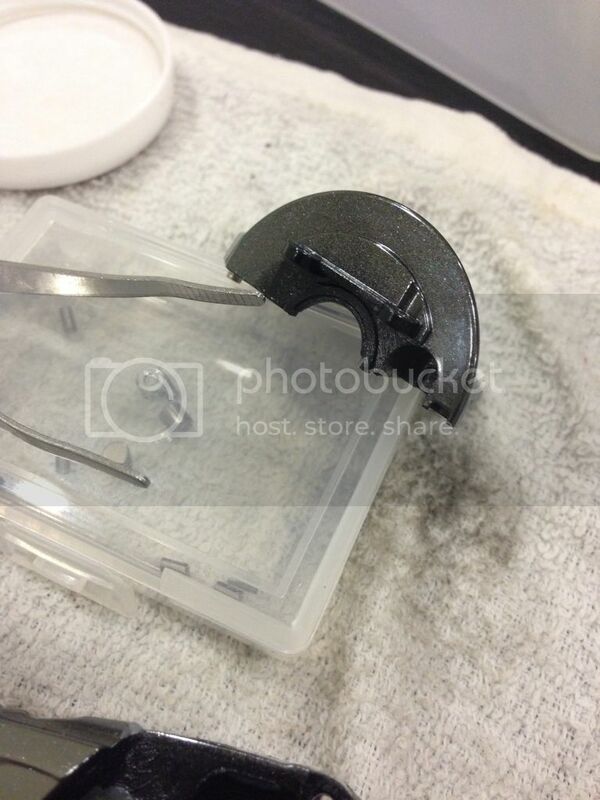 Worm shaft retainer plate in placed held by two screws. Bearing for one end of the drive gear in placed on the main body. 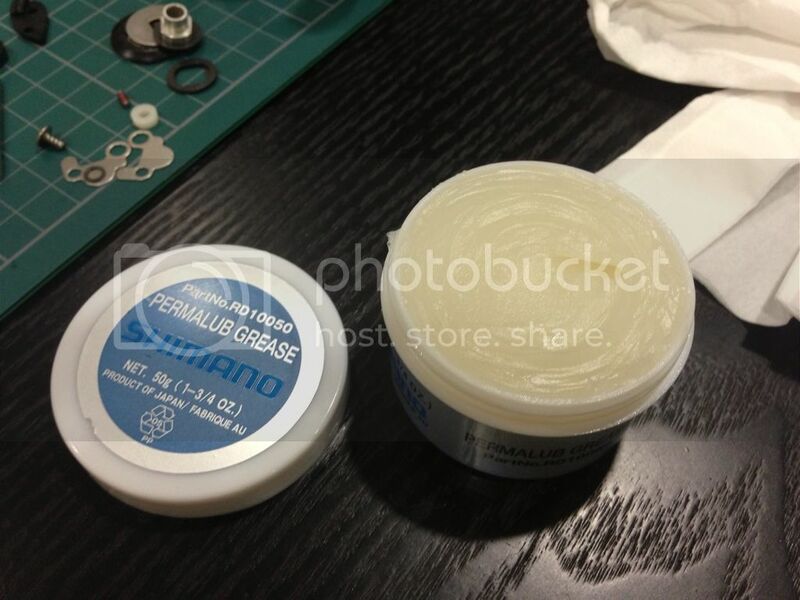 Shimano permalub grease applied to all the gears. 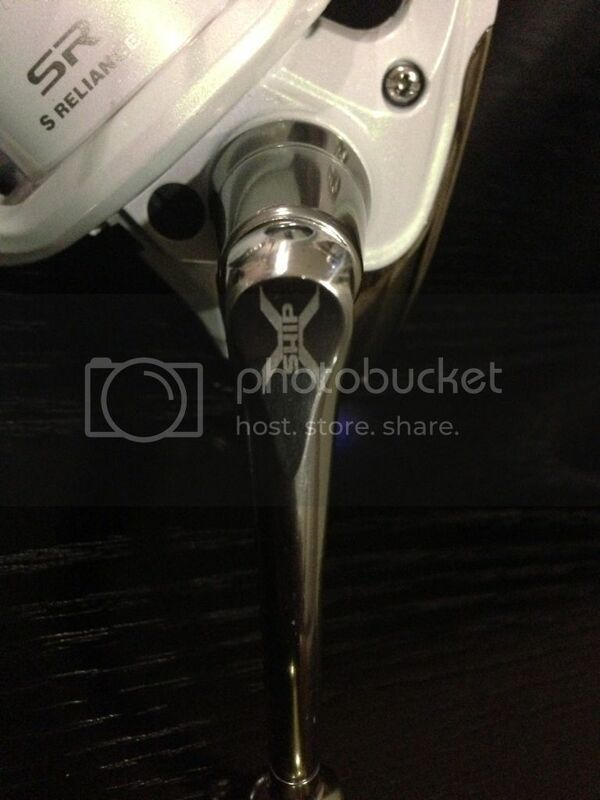 Notice that white colour plastic thingy where the Q-tip is pointing at? 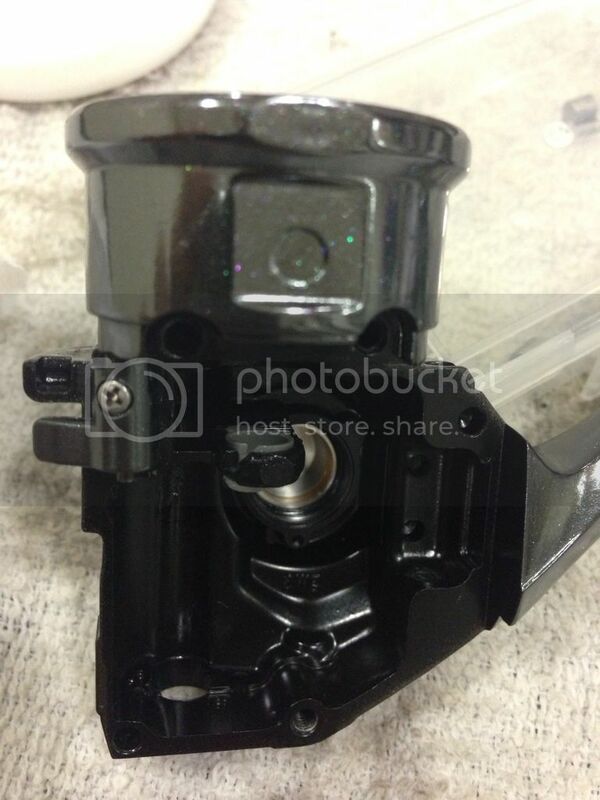 This is the rear protector collar, there is a screw within the collar. You will need this to secure the rear body protector cover later on. 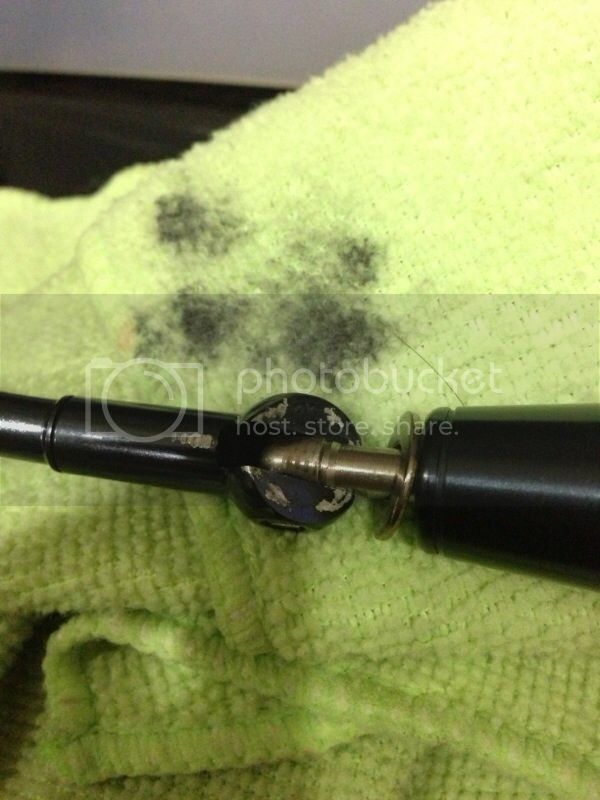 Apply more grease to this collar to prevent it from falling off. 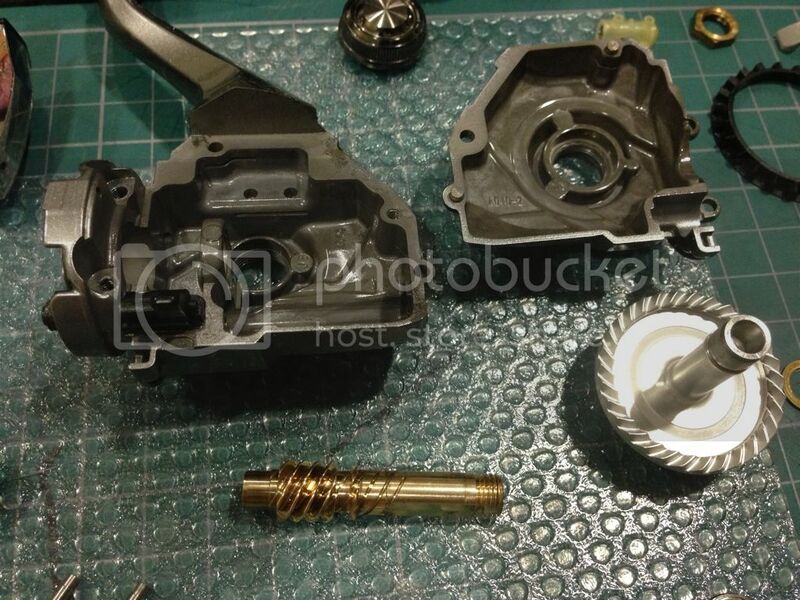 After the collar is positioned, next goes the drive gear, washer and the ball bearing. 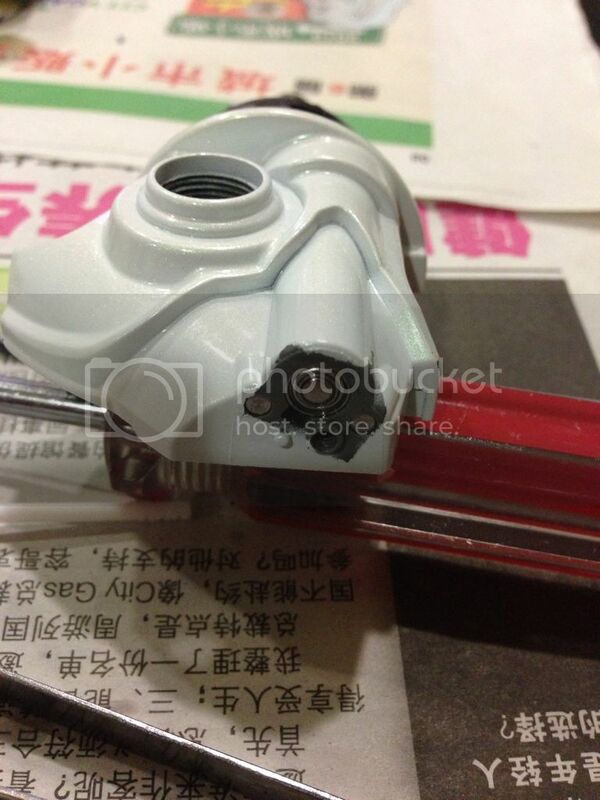 Place the flange rubber seal on the side plate. Do remember to put back the bail trip strike back. 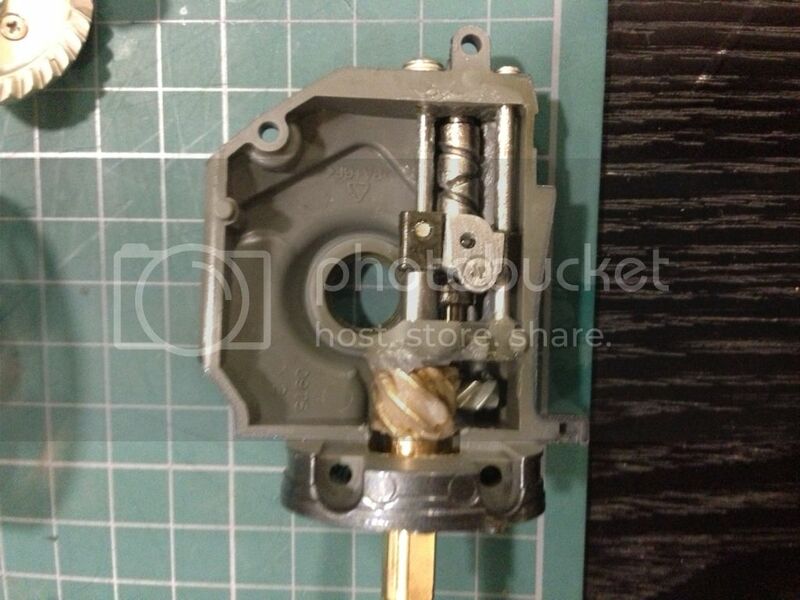 Put back the side plate which is held by 3 screws.